Acqua alta or 'high water' in Venice is a famous phenomenon; the subject of all those atmospheric photographs of the flooded city. It's a novelty for the visitor, an inconvenience for the locals, and an indicator of the threats faced by this fragile city. 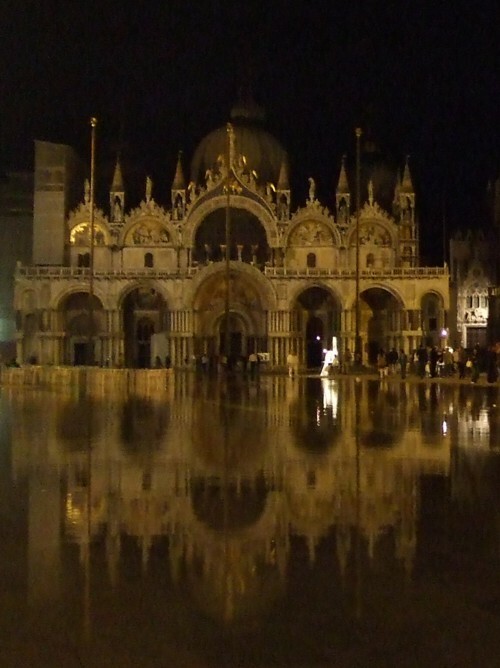 Acqua alta is an unusually high tide, which rises enough to flood parts of Venice. This flooding is most dramatic when a higher-than-average tide coincides with various other phenomena - such as heavy rainfall inland from the Venetian lagoon, a wind blowing in from the Adriatic sea or an area of low pressure. High water is most likely to occur between September and April, though it's not unheard of at other times. It's not as dramatic as thrill-seeking tourists may hope: the tide rises, water laps over low canalsides and rises up through the rainwater drains to cover low-lying paths and squares. Usually this minor flooding is short-lived and will subside with the tide after an hour or so. If you are planning ahead, you can expect the highest tides around the time of a full moon or a new moon. > High water 1st December 2008 (156cm) - my eyewitness account of the deepest floods for over 20 years. Acqua alta is predicted and monitored, and forecasts are published each day in local newspapers, on the council's Centro Maree (Tide Centre) website (see links panel on the right) and on a board by the Campanile in St. Mark's Square. Recorded information in Italian is available by telephone: 041 241 1996. There are also a few electronic displays around town (one is located at Piazzale Roma). Predictions based on lunar tides are available months in advance, so you can get an idea of whether acqua alta is possible during your holiday. But short-term factors such as atmospheric pressure, wind and rainfall make a big difference. The information listing provides the twice-daily times of high tide (massimo) and low tide (minimo), along with the predicted height of water above or below an average set at zero. +85cm is a fairly high tide, and will see some water rising up through drains into St. Mark's Square, the lowest part of town - enough for photo-opportunities but not enough to cause much inconvenience. 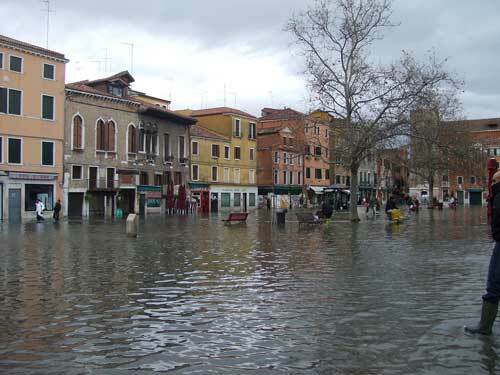 +110cm is high, and water will invade nearly 12% of Venice. When this level is predicted, sirens will sound a warning 3-4 hours in advance of high tide, warning residents to batten down the hatches and to don their wellies. Until 2007 Venice still used sirens dating to the Second World War to warn its residents of floods. Now the historic sirens have been replaced by a new, more complicated system. When the tide is predicted to reach +110cm a recording of the old-style sirens will still be sounded to warn of acqua alta. But this will be followed by another signal which will alert Venetians to the level of flooding expected: the more tones sounded the higher the water, from one tone predicting 110cm to four rising notes indicating serious flooding of 140cm. The speakers are concealed inside belltowers and public buildings. 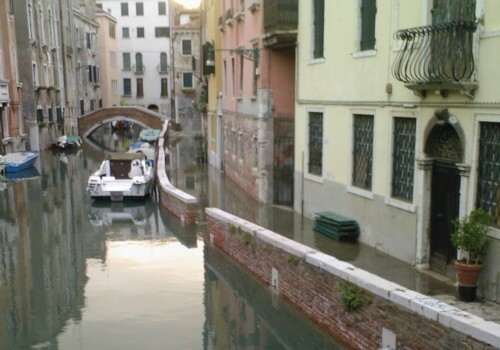 For high tides of up to 120cm, it's still possible to get around Venice on foot. A number of temporary wooden walkways (passerelle) provide raised routes around town; maps of these are on display at vaporetto (waterbus) stops, and on the Centro Maree website (under 'Atlante passerelle'). Off these routes you'll have to pick your path carefully, or decide to sit somewhere dry for an hour or two. If the floods rise above 120cm - which is very rare - the wooden walkways might begin to float and if the tide reaches 130cm you will find most of the city's thoroughfares underwater. Wellington boots are useful if you plan to march around regardless of minor floods. Tourist shops stock rubber boots and plastic shoe-covers when acqua alta is likely. Otherwise sports, hardware or fishing shops are a good bet (with boots from around €13), although these stores can be hard to find. Ask your hotel's advice - they may even have pairs you can borrow. When there's water everywhere it's more important than ever to behave in an orderly fashion (see more about how to behave in Venice). High water may be fun for first-time visitors, but locals still need to get about and they won't appreciate being splashed or obstructed. It's not a good idea to go barefoot - the water isn't clean and you can't see what may lie on the pavement underneath. Today I saw a dead rat floating in St. Mark's Square. It can also be hard to see where walkways end and canals begin, so proceed with care. Walking around Venice you'll see signs of the city's propensity to flood. When the ground floor of a building is inhabited, it has usually been raised (rialzato) to lift floor levels a few inches above the level of acqua alta. You can spot the tell-tale extra step built into doorways around Venice. Many doorways also have metal or wooden guards to keep out the lapping water. There are also ongoing projects around Venice to raise the level of pavements and canalsides. Venice's worst flood ever was a freak event in 1966 where water levels rose to 1.94m and flooded the entire city for a whole day, causing a great deal of damage, although no loss of life. In some ways, that particular event was beneficial for Venice, since it drew the world's attention to the fragility of the city and resulted in the establishment of organisations determined to safeguard Venice's artistic heritage and its future. Although a flood of this magnitude could happen again, it would take a very rare combination of circumstances and there is no need for tourists to be overly nervous. Venice's flood problem - why is it getting worse? Venice has twin problems of subsidence and rising water levels. The current plan to alleviate flooding consists of giant gates (called MOSE) at the entrances to the lagoon. Many locals, though, believe the development is a waste of money and may even worsen the situation. This remains to be seen, but Venice is certainly one of the world's first major cities to be threatened by rising sea levels due to climate change. In the classic book about the city, Jan Morris dreams of a Venice left to its fate, with solitary belltowers protruding from the lagoon waters. As a footnote, staying on the mainland won't guarantee you freedom from floods. Heavy rainfall (common in autumn) has been known to flood the streets of the mainland towns of Mestre and Marghera - a massive downpour on 26th September 2007 stranded residents in cars, flooded ground floors and left floods which took hours to ebb away through an inadequate drainage system.